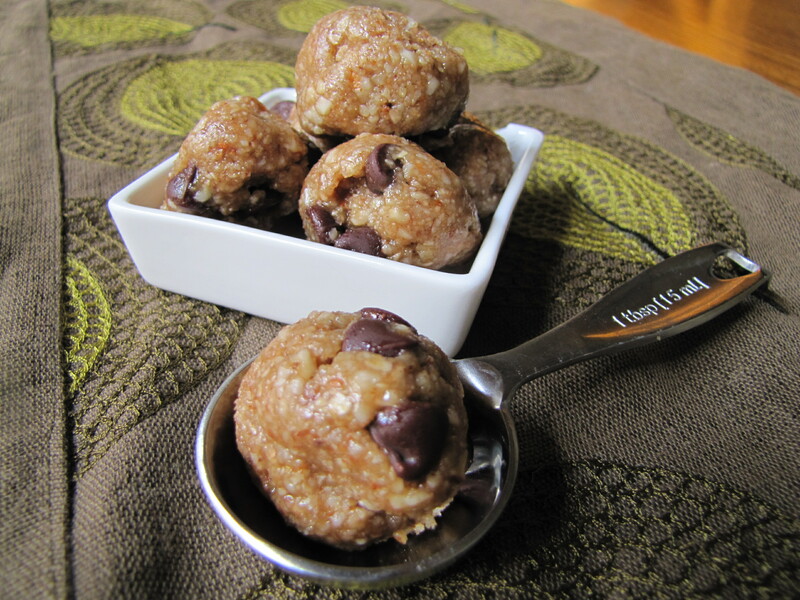 Raw Cookie Dough Bites – Voila! When I first offered James a bite of these awesome/addicting cookie dough bites, he looked at me skeptically, took a bite, and then said no thanks. Once I told him they were in fact “raw” cookie dough bites and had no raw egg (ironically), but only ground up nuts, oats, honey and chocolate chips, he couldn’t stop eating them. They sit in our freezer and it takes all our will power for us not to chow down. However, if I were to chow down I wouldn’t have the same guilt because there is no butter, oil or processed sugar! Hooray for healthy snack/dessert alternatives! I can easily see making a huge batch of these and bring them to picnics, on hikes, to the beach, parties, you name it. NOTE: These proportions are easily doubled, tripled, quadrupled, etc. 1. In a food processor, process the almonds, walnuts, oats, cinnamon and salt to a fine meal. 2. Add the agave nectar or honey, and vanilla and process to combine. 3. Next, pour batter into medium bowl. Add chocolate chips and fold into dough. 4. Roll the cookie dough into balls (about 1 tablespoon each) and place them on a cookie pan lined with parchment paper. Place the pan in the freezer for about an hour to firm up. Store balls in a tightly covered container in the freezer. These are easy enough for me to try. Yummy!! yes! they’re super easy and addicting!